It was another year of great design and innovation in the world of architecture, bringing us some unforgettable buildings from across the world, from Oldham to Tianjin. In our latest blog, we take a look back at our favourite buildings of 2017. One of the most innovative designs of 2017 was a celebration of every architect’s favourite toy: LEGO. Located in LEGO’s hometown of Billund, Denmark, LEGO House is a 12,000 square foot visitor centre, filled with 25 million LEGO bricks throughout numerous exhibition areas, each of which is designed to provide a space for children and adults alike to create using the famous little plastic bricks. 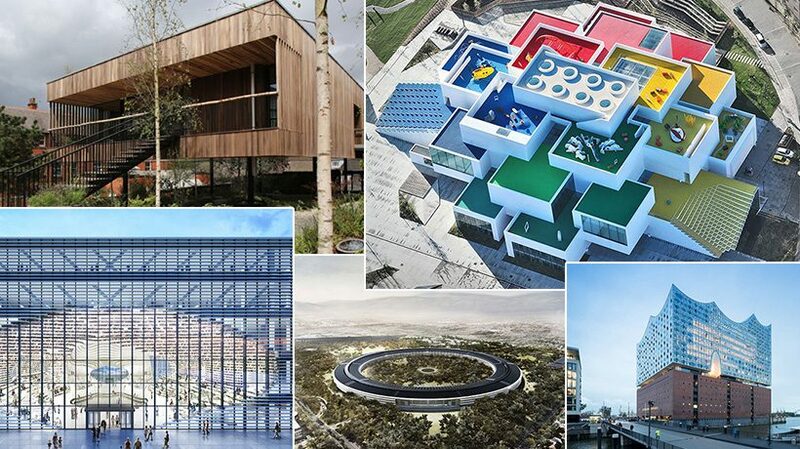 The ambitious, LEGO influenced design is the creation of Bjarke Ingels’ firm BIG. LEGO House is made up of 21 gigantic LEGO shaped bricks stacked on top of each other and is designed in such a way that the building is recognisable as a LEGO brick from Google Earth. Architect, Bjarke Ingels is a passionate believer in the creative power of LEGO, and remarked that if his firm “had been founded with the purpose of building just one building, this (would) be it”. Probably the most talked about new building of 2017 was the spaceship-shaped Apple Park. Running on 100% renewable energy, and costing $5 billion dollars, Apple Park is a sprawling 2.8 million square foot campus, home to 13,000 employees. The building is the brainchild of Steve Jobs, and the creation of legendary, Pritzker winning architect, Norman Foster. Jobs tasked Foster with creating a design which transcended the boundary between building and nature, resulting in a number of innovative design features, such as a ventilation system that funnels natural air in and out of the building. Maggie’s Centre, Oldham, is the 21st cancer rehabilitation centre created in-line with the vision of Maggie Keswick-Jencks, a writer, artist, garden designer and cancer patient, who made it her mission to create beautiful spaces of calmness and light to support cancer patients and their families. Some of the world’s most famous architects have been involved in the ‘architecture of hope’ project, including Zaha Hadid, Norman Foster and Frank Gehry. The latest architect to offer their services to the project is Alex de Rijke of dRMM. dRMM’s Maggie’s Centre is the first engineered hardwood building in the world and offers serene views of the surrounding Pennines. The uniqueness of the design lies at the heart of the structure, where, from a central oasis, a tree grows up through the building, bringing the peacefulness of nature inside. Perhaps the most original design of 2017, the facade of this Chinese public library is designed to resemble a giant eye staring back at the observer. If the exterior is a sight to behold, the interior is equally stunning, with swirling white bookshelves, flowing ribbon-like around the five-storey high library hall. Designed by Dutch firm MVRDV, the Tianjin Binhai Library is surely one of the world’s most beautiful libraries, providing a magical space for the citizens of Tianjin to lose themselves in the world of books. One of the most eagerly anticipated buildings of 2017, the Elbphilharmonie has been many years in the making, generating huge buzz around the stunning design created by Swiss architects Herzog & de Meuron. The project was first conceived some 15 years ago, and, despite spiralling costs and a parliamentary inquiry, it was received with great critical acclaim when it finally opened in January of this year. The building itself contains two concert halls, with space left over for a hotel and residential apartments.This dynamic, wave-like structure, will serve as a state of the art concert hall for Hamburg and will breathe new life into the decaying dockland of that city, as a concert destination as well as a tourist attraction. What have been your highlights of 2017 and which buildings are you most looking forward to in 2018? Stay tuned to the Selo blog where next time, we reveal the buildings we can’t wait to see in 2018. To discuss any project requirements, we'd love to hear from you - please get in touch.